Filled with intricate patterns and uplifting quotes, keep these books in your handbag or by your bedside so you can colour yourself happy, whatever the time of day. It is impossible to close the cover on this book without feeling calmer and more inspired than when you opened it. 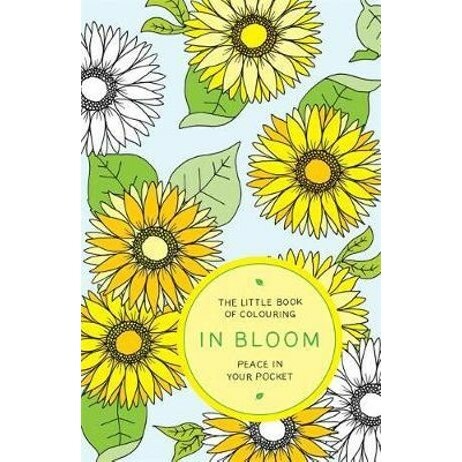 Printed on top quality paper, this pocket-sized book is packed with uplifting quotes and over forty stunning illustrations from vintage floral patterns to intricate wildflower meadows, this book will help you relax, de-stress and kickstart your creativity. Other titles in the series: Little Book of Colouring: Animal Kingdom and The Little Book of Colouring: Patterns. Amber Anderson is a freelance illustrator from London, UK. Her work is almost always highly intricate, she enjoys capturing a sense of nostalgia and unusual environments in her illustrations. Some of her past projects include illustrating board games, shop interiors, clothing and accessories as well as working in commercial settings. She enjoys focusing her work on illustrating products, that people can use and enjoy.